... Lee Graves, who writes a beer column for the Richmond Times-Dispatch, under the moniker, The Beer Guy. "Richmond Beer" is, of course, a history of brewing in Richmond, but it's also a look at the history of beer in all of Virginia. Graves writes in a breezy, conversational style, reporting on Jamestown and beer in the early 1600s, and then, Richmond's history, from then to the present. Richmond did not legally became a city, until 1742 —with a population of 240. Its first recorded brewery was in operation in 1800, owned by William Hay and "a Mr. Forrester," on the northeast corner of Canal and Fourth Streets. Although there were lager-beer breweries built in the city during the first half of the 19th century, Richmond's beer business really took off after the conclusion of the Civil War (maybe we should call it the War Between the States). That included a mammoth, yet unsuccessful venture, by Pennsylvania's Yuengling. The rest of the book, indeed most of it, deals with that moment forward, with what was then known as the microbrewery movement, and, now, as 'craft' beer. There were some bubbles of growth which burst, and some false starts. For instance, Richbrau would close in 2010, leaving only one brewery, Legend Brewing (and its associated pub), open in the city and its environs. But, today, only a few years later, Richmond has eight breweries and brewpubs for its 214,000 citizens. And, that's thirteen breweries, if you include others in the vicinity, with more in planning. Graves provides profiles of many of those breweries, their owners and brewers. Since I started researching this book, more than a half a dozen breweries have opened in Richmond. one of my great pleasures has been getting to know the owners, brewers, and beer lovers associated with each operation and tracking how they have fit into both the craft-brewing circle and the larger community. Graves concludes with listings of the city's breweries, taphouses, beer stores, homebrew shops, and other resources. (He credits a lot of the resurgence of 'craft' beer in Richmond to the perseverance of homebrewers such as the James River Homebrewers.) These addenda make Richmond Beer, already a fun-to-read history of beer in the capital of Virginia, a helpful beer tour guide, as well. 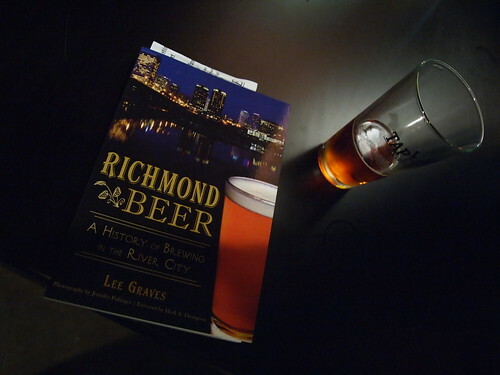 "Richmond Beer: A History of Brewing in the River City." "The Beer Guy" column, in Richmond Times-Dispatch. 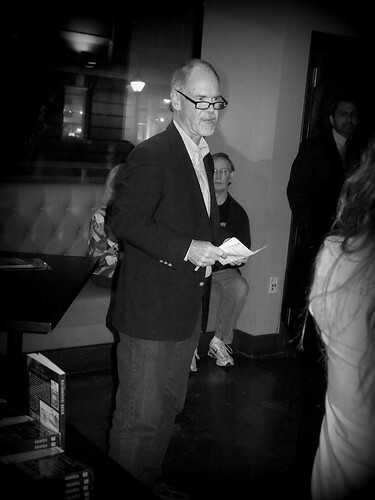 The photos above were taken on 5 November 2014, at the official book launch celebration for "Richmond Beer, held at a newish good-beer pub, the Southern Railway Taphouse, which, appropriate to the story, is located in Shockoe Slip, and where, again appropriate, quite a few of its forty taps, that evening, were dedicated to Richmond and Virginia beers. One vent of many during RVA Beer Week. Richmond.com's beer columnist, Annie Tobey, reviewed Richmond Beer: here.